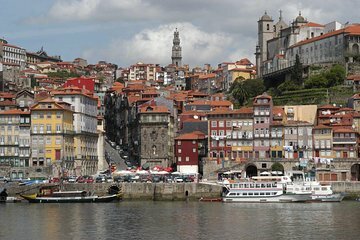 Descubra o melhor que o Porto tem para oferecer neste empolgante city tour de 6 horas. A cidade classificada como Património da Humanidade pela UNESCO é um destino popular para os visitantes e o nosso passeio irá parar em algumas das principais atracções, incluindo o Mercado do Bolhão, Paços do Concelho, Castelo do Queijo e a Catedral. Veja o que torna a cidade única, explore seus mercados e experimente o vinho local enquanto visita a cidade com um guia informativo. Um delicioso almoço Português será fornecido. Notre guide Daniel a été fantastique, suite à l'annulation d'une personne nous l'avons eu rien que pour nous!!! Il nous a fait découvrir Porto sous tous les angles et surtout avec passion. Le déjeuner chez Lapin est correcte mais sans plus, c'est l'élément que je changerais. This tour was ok. I expected more of a walking tour instead it was more by car and with traffic we lost time. They mixed Spanish and English visitors so everything was explained twice losing more time. Explainee too much history in the train station lising our group of 5 attention. Guide was ok.
Great and experienced conductor, tried to tell the history of the city and the various places we were in. However there was a misunderstanding: I was convicted that this was a full-day tour, and that was the reason why lunch was included!!! The tour was amazing 5 star- we booked it along with the lunch zero star. The restaurant staff were far from happy to see us, we were passed between 3 employees before getting a seat. We sat for 3 hours waiting on food that wasnt worth the wait. Main issue was the staff- horrible people!